Second Report from Karin´s Wellness Trip – Detox in Ubud, Bali. Change Your Life & Perspective in Ubud – Part 2. Ubud is a great place for detox on various levels. Where ever you will go you will find cafés and restaurants offering wheat grass shots, raw food, freshly squeezed juices and coconut water. 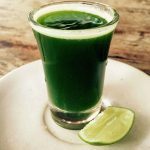 Wheat Grass shots are available in many places and cheap in Ubud, Bali. 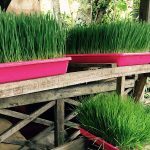 Wheat grass growing in Ubud, Bali. If you are serious about your detox or wants the comfort on having it all planned and laid out for you, there are several different detox packages to choose from. Similar to an all-inclusive package which is very convenient since detoxing on a hot day can be quite challenging. Another benefit from participating in a detox program is that you are sure that all juices are made through “slow juicing” which means there are more enzymes and nutrients left in the juices. Trust me, you will need every nutrient you can get when detoxing, especially in a tropical climate like Bali´s. The price tag on the detox programmes varies from 900US$ to 5500US$ per week, depending on where you stay. If you want a DIY detox program you can visit the different juice bars on your own and save a few bucks by doing so (even if you cannot be certain that all juices are “slow juiced”). The Yoga Barn (also mentioned in this article) offers 3 or 7 days detox programs. Their detox programs contains both juices and raw food and you will also learn how to juice and make raw food properly during the program. Price is about 2000US$ for a week including accommodation. The only negative I can think of is that their programs only run certain times of the year. 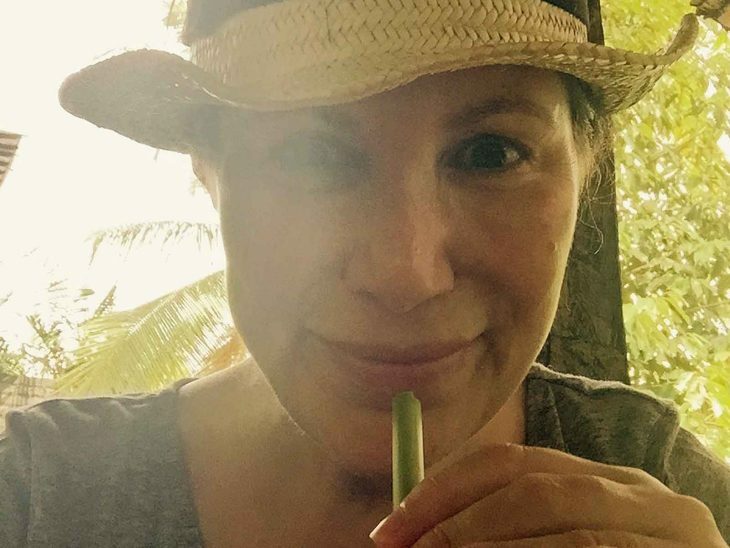 Karin is detoxing on Bali, here sipping on fresh coconut. 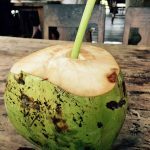 Fresh coconut water, right out of the nut in Ubud, Bali. A cheaper option is Ubud Sari Resort. This is a detox program where accommodation is basic and all the pampering is excluded. Ubud Sari has a very good reputation, a reasonable price tag (about 1000US$) and their detox programs runs all year, which means you can book yourself a detox at any time. If you want to splurge, I recommend Five Elements where everything is luxurious, especially the accommodation. Their therapists are all westerners and the price tag is about 5500US$ for a weeks detox. I chose Bali Vitality which I am very happy with. It is an excellent option with a price tag around 2000US$ for a week where almost everything is included. 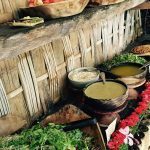 Accommodation, all juices, nutritional supplements, and massage almost every day, colon irrigation, infrared sauna, baths in hot and purifying wells, private yoga teacher and more is included. The accommodation is similar to a good moderate hotel and the therapists are mostly Balinese. 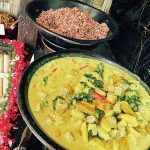 Vegetarian, organic buffet at The Yoga Barn in Ubud, Bali. Sunday Buffet at The Yoga Barn in Ubud, Bali. You are probably curious to find out what it is like to detox on Bali? If you are doing it during December (like I am doing right now) with 30C degrees and 80% humidity it is quite tough. A real boot camp. I have gone from one extreme to another. From energized and euphoric to tired and cranky, almost ready to go home. I have been sweating profusely 24 hours a day and often been hungry. The ones who claim you are not hungry after 3 – 4 days don’t know what they are talking about. Even though it is tough sometimes you will be rewarded with a sense of enlightening, clearer skin, a body that feels more pure and agile and several kilograms lighter. For me the best way to deal with challenges was to relax by the pool or read a book in the shade. If you choose a DIY detox, please do not forget to ask for sugar-free juices because the Balinese are keen to sweeten your juice with a little extra sugar. Choose green juices as often as possible since fruits contains fructose which is sugar. Wheat grass shots are perfect and very affordable at 1 – 2US$ per shot. Do not forget to drink lots of coconut water which is hydrating your body in a good way. If you want to know more about Karin Tydén, please check out her presentation. 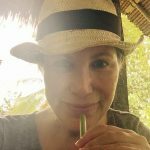 Please check out her previous report if you want to know more about yoga in Ubud. Bookmark http://www.thinkingoftravel.com/tag/karin/ if you want to follow Karin´s adventures in recharging and well-being on Bali. If you have favourites or tips about detox Bali, please do not be a stranger. I would love to hear from you on Twitter, on Facebook or in the comments below.